Prudent people pay attention to wise advice to steer clear of reputation-damaging people and places, as King Solomon tells us in Proverbs 2_11-12: “Counsel shall keep thee, and prudence shall preserve thee, that thou mayst be delivered from the evil way, and from the man that speaketh perverse things.” While the wise king had actual bad influences in the real world in mind, it’s increasingly true that the same points are valid when moving in cyberspace. Most everyone knows that many employers use a job applicant’s social media activity as a hiring tool. But as new lending regulations take effect today, an article from Fast Company reveals just how important that Facebook profile or Twitter feed can be for loan applicants too. January 10, 2014 marks the day that the Consumer Federal Protection Bureau assumes oversight of the lending industry with new lending protocols established under the Dodd Frank Act. These new regulations are intended to protect both borrowers and lenders from the kind of meltdown that caused the housing collapse of a few years ago. What this all means is that most lenders processing applications for mortgages and other kinds of big-ticket consumer loans are taking a closer look at a borrower’s credit history and any other factors that could affect the ability to repay. And increasingly, social media is entering the mix. 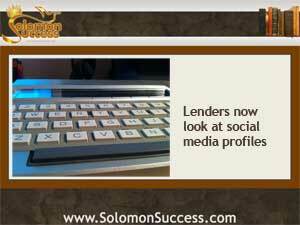 Social media can reveal a lot about a loan applicant’s financial and social situation – perhaps more than their actual FICO score or other credit ratings. In addition to revealing the obvious, such as the almost stereotypical drunken party pictures or an announcement about getting fired from a job, social profiles and posts can show lenders what an applicant owns, whether they spend time in high end places, who they know, and what their values are. People who post a lot of pictures of expensive vacations, or tweet about their new car are unwittingly providing income information – as is someone who keeps a blog about the family’s efforts to save money or talks online about a couch found on Craigslist. It’s an uncomfortable truth that, in the new, hyper vigilant and cautious atmosphere of consumer lending, virtually anything in cyberspace can – and potentially will- be used against you. Of course, applicants aren’t required by law to provide links to social media profiles on their loan applications. And it’s certainly possible to adjust privacy settings on some sites to keep information from public view. Some borrowers volunteer that information in an effort to help their chances of approval too. But consumer advocates worry that whether they voluntarily share social media activity with lenders or not, borrowers’ creditworthiness could be undermined by social media for many reasons. Because so many kinds of information are revealed not just by what you say or show on social media but also by how you use the site and what contacts you have, it’s virtually impossible to know what might be perceived as damaging. Troong, Alice. “Your Social Media Activity Could Prevent You From Getting a Loan.” Fast Company. FastCompany.com. Jan 10 2014. Start the New Year with investing lessons from the pros at jason Hartman’s Meet the Mastres of Investing Event in Irvine, CA January 18-19, 2014. Learn more here.